Reading about ancient civilizations leaves you with a lot of questions, but perhaps the biggest is: what was life in these civilizations like? Was it comparable to modern life? 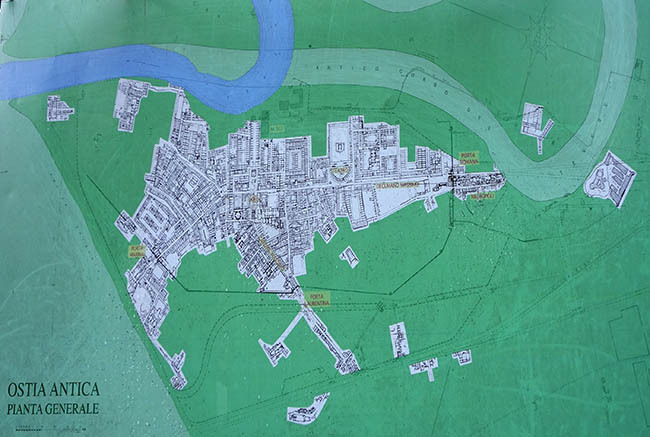 What was it like to live in the average Roman city? What did 90% of the citizens of the empire see on a daily basis? What was it like to walk from your insulae, or apartment block, to the local theatre? You can see Rome itself, or any of the many colonies, but they’ve been inhabited for two thousand years, or longer (Rome itself has been inhabited for more than 2700 years). During that time, the city transmutes: the old city is slowly wiped away and a new one takes its place. It’s difficult to get a feel for what the city felt like before everything changed. I really wanted to see a city that hadn’t changed so much over time – one where you could walk the original streets and see everyday buildings. There’s many cities like this: Pompei’i comes to mind, and was the city we’d most considered before arriving in Italy. But it’s a very long trip from Rome – a very full day trip. And, it’s reputed to be incredibly crowded. 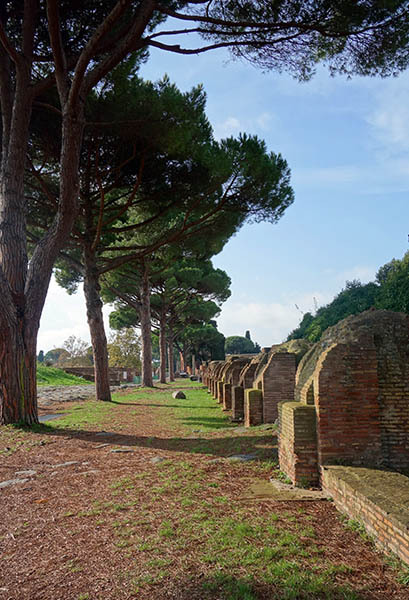 Searching for alternatives, I read about Ostia Antica, which is a half hour train ride away in a suburb of Rome near the Mediterranean coast. I’m so glad I stumbled on that recommendation, because it was the highlight of the trip for me, and a really magical experience. 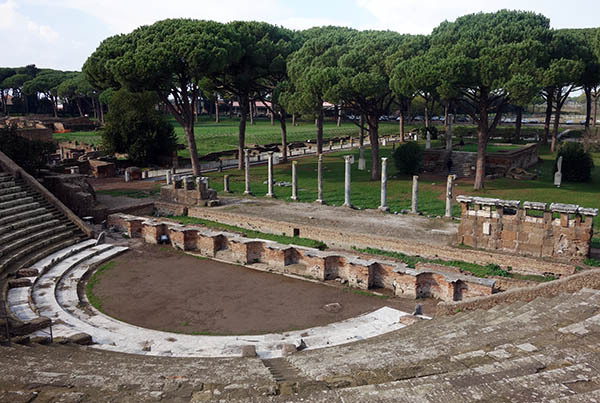 Ostia was the port of Rome for much of the city’s imperial history. Eventually it fell into disuse as the harbor silted up, and was finally abandoned and covered with successive layers of debris until the original city was completely hidden. It was re-discovered and used for marble during the Renaissance and Baroque periods, and there were extensive excavations under Mussolini. Since the 60s, there have been modern, scientific excavations that are still ongoing. I’ve seen a fair number of “lost cities,” but mostly in the American southwest: pueblos, kivas, and so on. All these sites take about 10 minutes to circumnavigate. They’re fascinating for what they are, but amount to a tiny village supporting 300-500 people, with 30-40 buildings. Thus, I was totally unprepared for the extent of the ruined city. 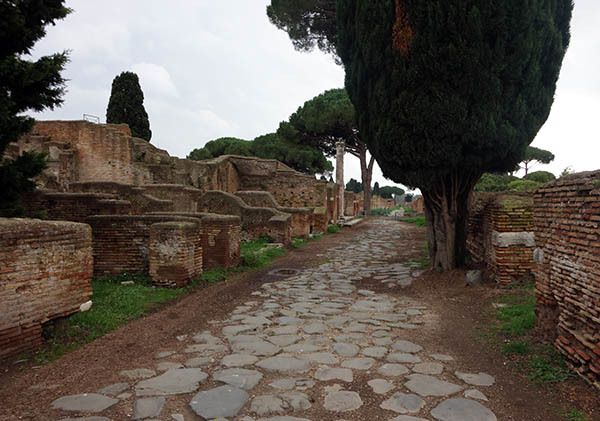 At its height, Ostia had 100,000 inhabitants. It was the port that connected Rome to the outside world. These aren’t some limited ruins. There’s miles of them. 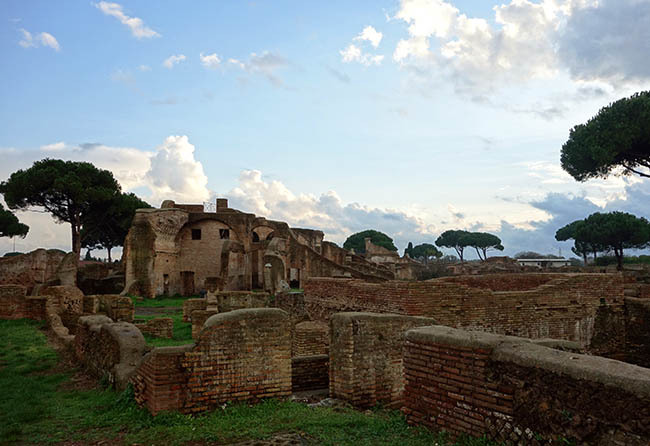 We arrived in Ostia in the late morning on Thanksgiving day. The site is a 5-minute walk from the local train station, down a quiet street. The place was deserted: pay the sleepy guard an entry fee and you’re inside and on your own. 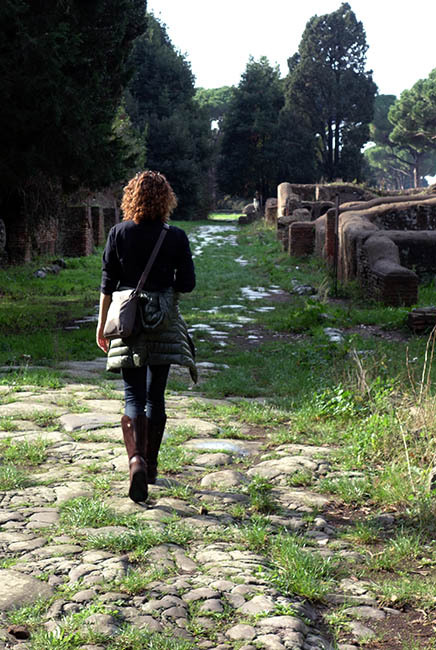 We started slow: I wanted to savor the experience of seeing an authentic Roman town. Inside the gates, the first thing you see is the necropolis. Roman cities didn’t have integrated cemetaries, or even cemetaries that functioned as parks: rather, bodies were buried outside of city limits, usually in mausoleums, which grew understandably crowded until they almost became cities themselves. These necropolises were the first thing to greet ancient travelers, and I guess they still are. Past this, there were the ruins of the old gates and a small square. Not knowing the scope of the site, I figured this was basically everything. Maybe a theatre a little bit down the original Roman road. How wrong I was. 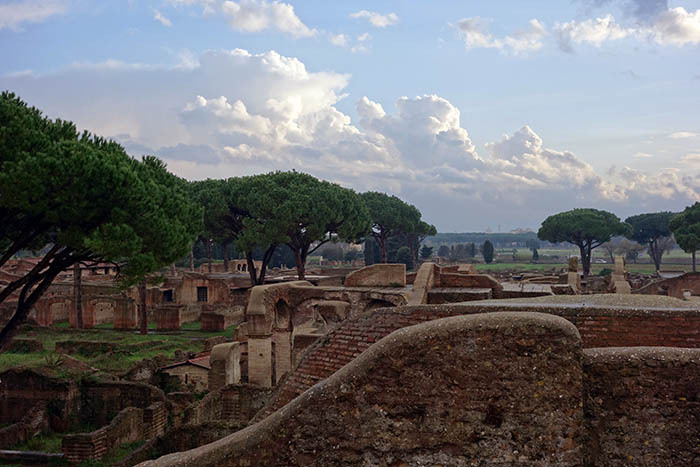 One of the highlights of Ostia was seeing the baths: a part of every Roman city, there were multiple baths spread among the ruins, each covered with wonderful mosaics. It was remarkable seeing the artwork up close and in situ. 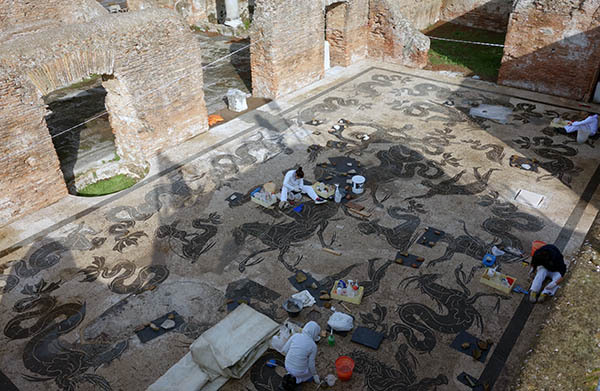 Up one staircase, with a good view, we could look down at archaeologists preserving the largest extant mosaic in the city. It was madness to imagine Romans walking across the very floor of the room two thousand years ago. There was also a huge theater: a few small pieces of fresco and plaster still hung inside one of the entries. The theater opened up on a huge temple square, also covered with diverse mosaics and grottoes around the edges that were used by merchants. For the entire time we were visiting the city, I think we saw 15-20 groups of people. I attribute this to it being November, the site not being very well known (at least, compared to everything else in or near Rome), and the mixed weather: although the day started beautiful, it grew more cloudy until rain started in mid-afternoon. We stopped at midday to eat lunch at the mediocre Ostia cafe (some lasagna, chili potato chips, and espresso). 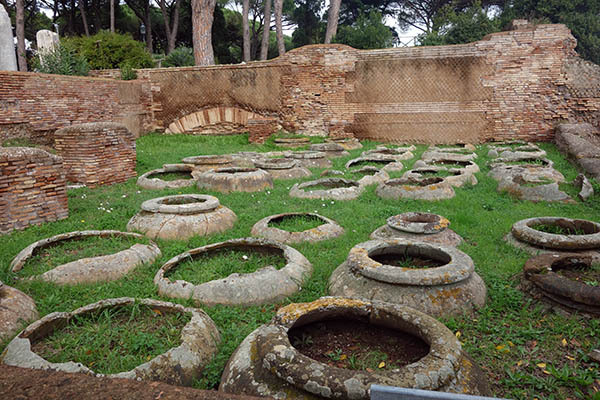 Near the cafe, they had partially cut stones: columns that were still emerging from the marble blocks they were transported to Ostia inside. This method of transport was common, because it prevented the marble from breaking or shattering in transit. The cafe was near the river and, like in other ports, there were also huge warehouses. Here, though, they were full of enormous amphorae, the large jugs used to store oil and other supplies. About two thirds of the through the site, after walking for maybe a mile through the ruins, the road forked into a huge Y. Here it really emptied out: we didn’t see anyone. Further out, the ruins were even more cool than in the main part of town: there were several buildings that still had frescoes inside, with the original paint intact. The Roman aesthetic on these frescoes was totally different from any sort of modern artwork. Sparse, with gaudy colors, and frankly ugly from the modern perspective. I think this was to compensate for the lack of adequate interior lighting. We wandered around for quite a while, checking out all these buildings, before the weather turned. 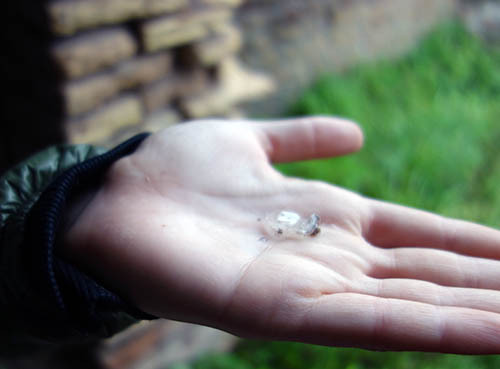 After the rain grew more severe and began to pour, it even hailed for a little while. We took shelter under some of the ruins (you can walk inside) and waited out the weather, which passed after just half an hour. Stepping out, we saw a full-on double rainbow. 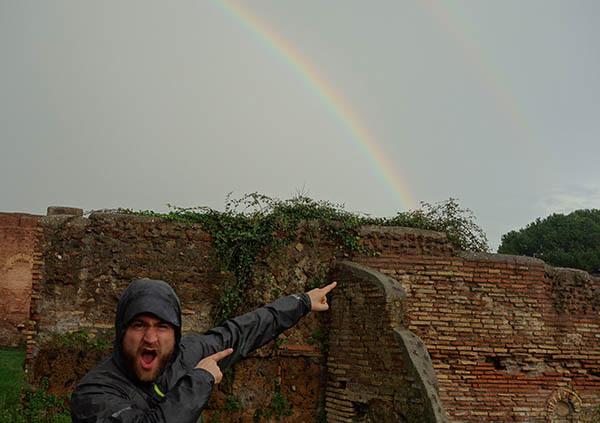 It was almost a triple rainbow! After the magic of seeing a double rainbow, the sky began to clear, and the setting sun made the remaining clouds glow. We found a great overlook to see some amazing views. 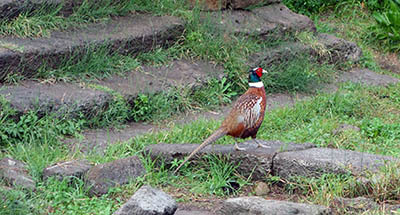 There was little wildlife around, but one cool local resident was a pheasant, which we chased around the ruins for a little while before it took flight. I’d have loved to stay longer, but unfortunately it was getting dark, and the rangers started herding us out of Ostia. In all I think we spent about 6 hours there, but I’d have been happy spending twice as long. I think we honestly only saw half of what the ancient city had to offer. Walking back to the train station, sky deepening to indigo, we passed a dirt field with kids playing soccer. 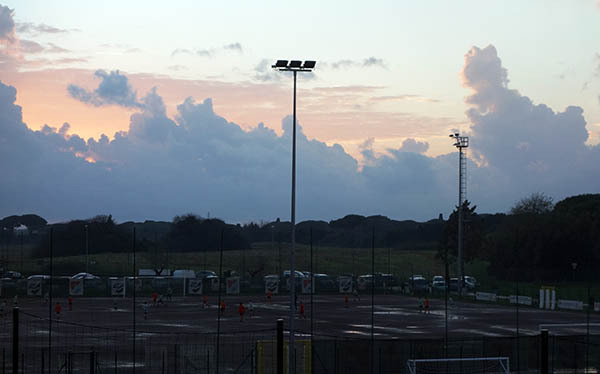 What could be more Italian than soccer next to an ancient Roman city? 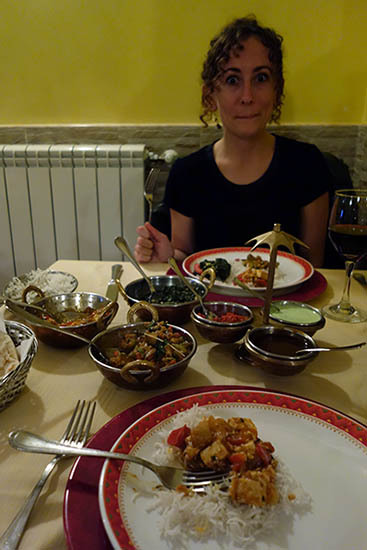 Returning to Rome itself, we still had to celebrate Thanksgiving day, and decided to celebrate in proper Pilgrim fashion by eating Indian food. This entry was posted in Italy on March 1, 2015 by rob.